Last week, I highlighted abuse of Germany’s newly implemented speech law, NetzDG, intended to regulate the spread of disinformation and hateful rhetoric online. 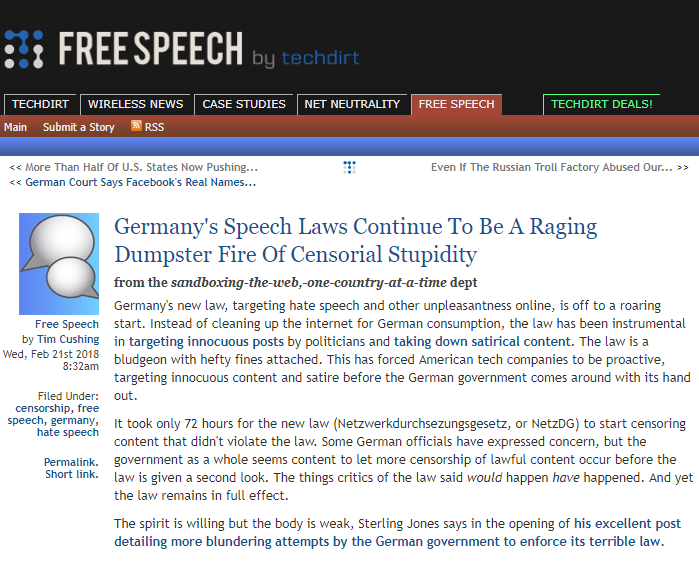 Yesterday, Techdirt hoisted the would-be censors who are abusing the new law. Germany’s new law, targeting hate speech and other unpleasantness online, is off to a roaring start. Instead of cleaning up the internet for German consumption, the law has been instrumental in targeting innocuous posts by politicians and taking down satirical content. The law is a bludgeon with hefty fines attached. This has forced American tech companies to be proactive, targeting innocuous content and satire before the German government comes around with its hand out. It took only 72 hours for the new law (Netzwerkdurchsezungsgesetz, or NetzDG) to start censoring content that didn’t violate the law. Some German officials have expressed concern, but the government as a whole seems content to let more censorship of lawful content occur before the law is given a second look. The things critics of the law said would happen have happened. And yet the law remains in full effect. The spirit is willing but the body is weak, Sterling Jones says in the opening of his excellent post detailing more blundering attempts by the German government to enforce its terrible law. While intended to stop the spread of disinformation and hateful rhetoric online, recently published “local law” complaints show that would-be censors are using NetzDG to target all variety of content, including mainstream news stories, sexual words and images, an anti-Nazi online forum, and criticism of German Chancellor Angela Merkel and of the NetzDG law itself. So, that’s how the law is working out. Sterling’s post is filled with takedown notices forwarded to the Lumen Database — all of them targeting speech that doesn’t appear to be unlawful even under Germany’s screwed up laws.